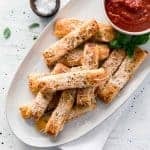 Easy cheesy pizza sticks are made with store-bought dough, pizza sauce, and cheese, and only take 20 minutes to make, start to finish. I tell myself every year to gear up for the month of May and every year the month of May takes me by surprise. If you have school-aged children, I’m sure that May is as busy for you as it is for me. 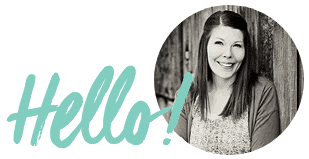 It’s busier than the holiday season for our family! Between end-of-year testing, parties, field trips, and graduations at school and the recitals, baseball/t-ball practices and games, Scouts, and a million other after-school events, it feels like we have something going on every day of the week. They are super fun things, but busy things. 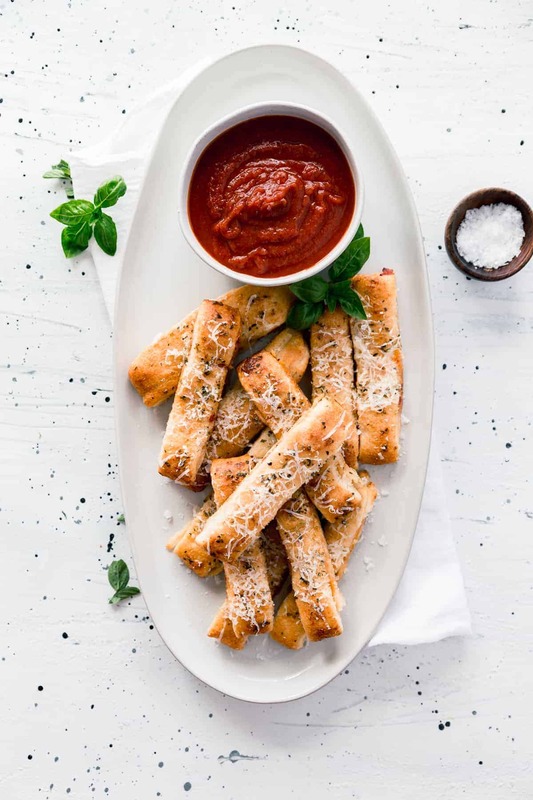 That being said, May is a month to have some super FAST dinners up your sleeve and this cheesy pizza stick recipe is just what May ordered. 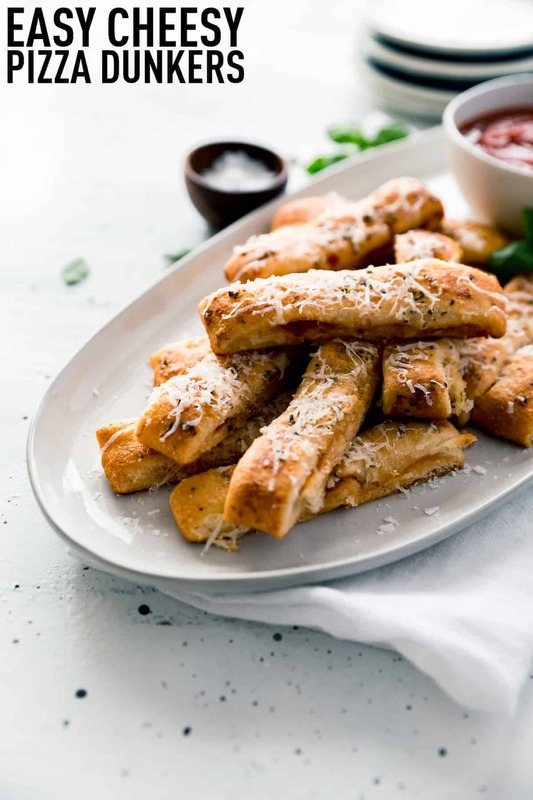 20 Minute Easy Cheesy Pizza Sticks are just what they sound like – pizza sticks done in a hurry! 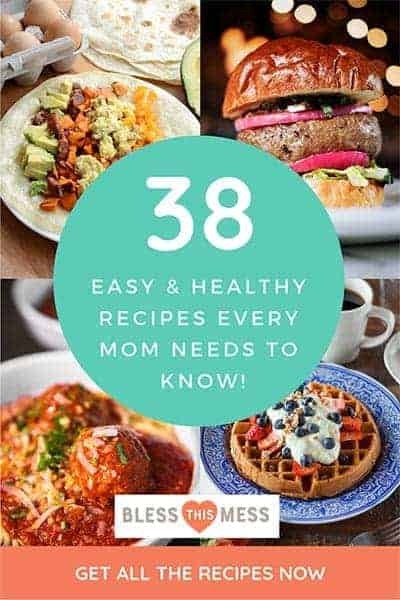 The secret is using canned crescent roll or pizza dough. Then you just fill it, fold it, slice it, and bake it. 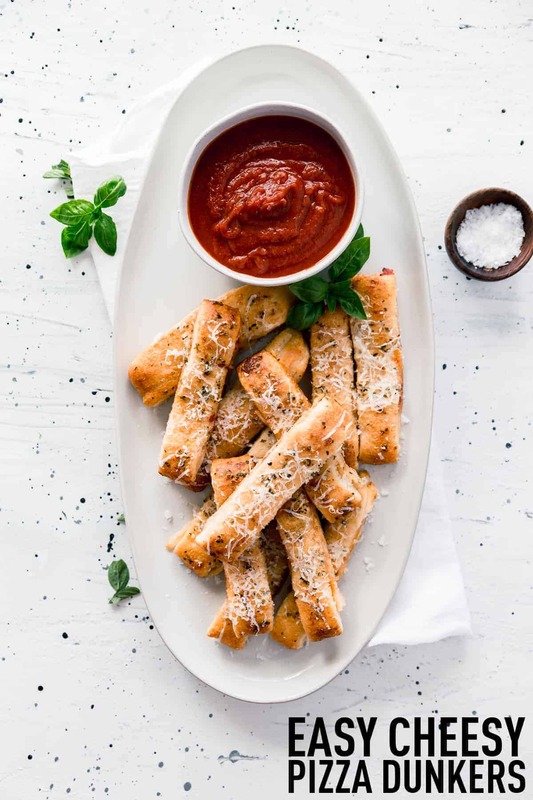 They are easy for kids to grab and dunk in their favorite sauce (or roll in a napkin and eat while running out the door to the next thing). You can fill them with just about anything you’d like but I’ve found simple cheese and pepperoni always go over well in this house. The topping that you add to the outside of the pizza sticks is so good, too. It’s full of flavor and makes this easy recipe kid- and adult-approved. Hang in there, busy mamas. Summer break is coming; we just have to get through May first. 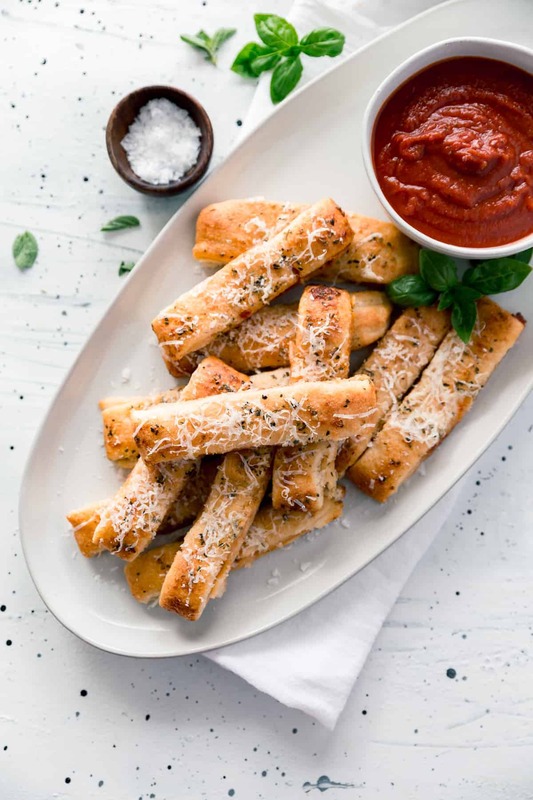 This easy pizza stick recipe will help you do just that. You can also used canned pizza dough, store-bought pizza dough (you can normally find it in the refrigerated section near other pre-made things like salads or sushi), or around 8 ounces of my favorite homemade pizza dough. These make great party food, too! Very little prep or mess on your end and everyone likes a warm, cheesy finger food. You can fill these with what you like but be careful to not overfill. The inside bottom crust won’t cook up well with too many toppings and nobody wants soggy pizza dough. Sometimes I use melted butter instead of the olive oil for brushing the top, and it’s also delicious. Looking for the best (and easiest) pizza sauce recipe? You’ll need 2 tablespoons olive oil, 2 cloves garlic, and 1 (28-ounce) can crushed tomatoes. In a small sauce pan, cook the oil and garlic together over medium heat until the garlic starts to smell good. Add the tomatoes and simmer until it thickens a bit, about 15 minutes. Season with salt and pepper to taste. DONE! Really. Three ingredients and it tastes amazing! Use the amount needed in the pizza dippers and serve additional sauce for dipping. If I’m buying sauce, I like the Delallo Pizza Sauce (and it’s $2 a jar which is a great price) and Muir Glen organic pizza sauce. 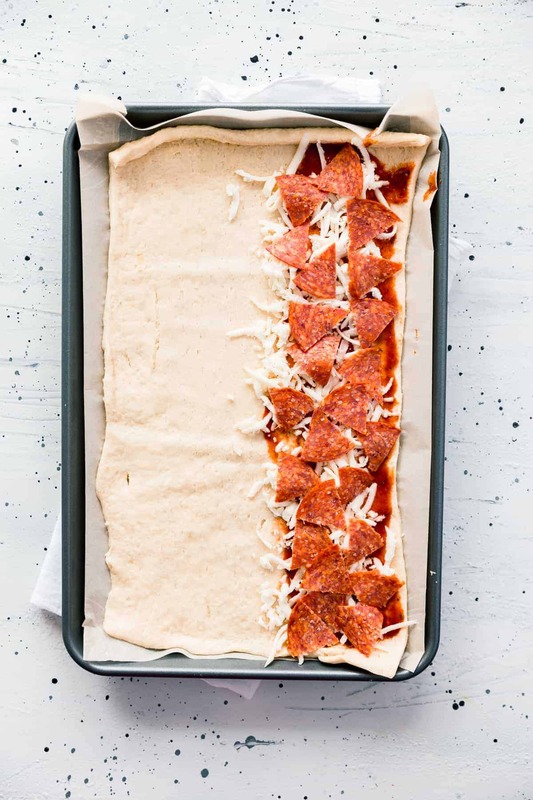 Unroll crescent dough sheet on baking sheet and gently press to form an even rectangle. Spread 1/4 cup pizza sauce lengthwise across half of the dough. Sprinkle the mozzarella over the pizza sauce and arrange the pepperoni on top of the cheese. Fold the dough in half lengthwise, gently pressing to seal the dough on the bottom and sides. Using a knife, cut through the dough into 12 even sticks. 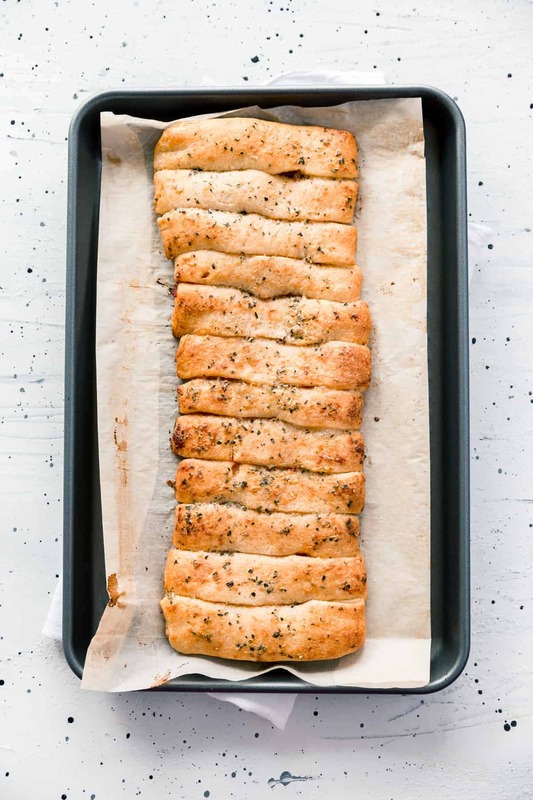 In a small bowl, combine the olive oil, 2 tablespoons of parmesan cheese, garlic powder, basil, oregano, and salt, then brush over the top of the dough sticks. Bake for 15-20 minutes or until deep golden brown on edges. Cool for 5 minutes and serve with warmed pizza sauce for dipping. You can also used canned pizza dough, store-bought pizza dough, or around 8 ounces of my favorite homemade pizza dough. We love all things pizza, cheese pizza sticks included. That should help with any pizza craving you might have. Enjoy from my kitchen to yours and good luck getting through the rest of the month, friends. These plus Netflix equals life complete. That sounds like a perfect combination!